This is a later passage from the same letter to the London Committee from James Knight at York Fort. 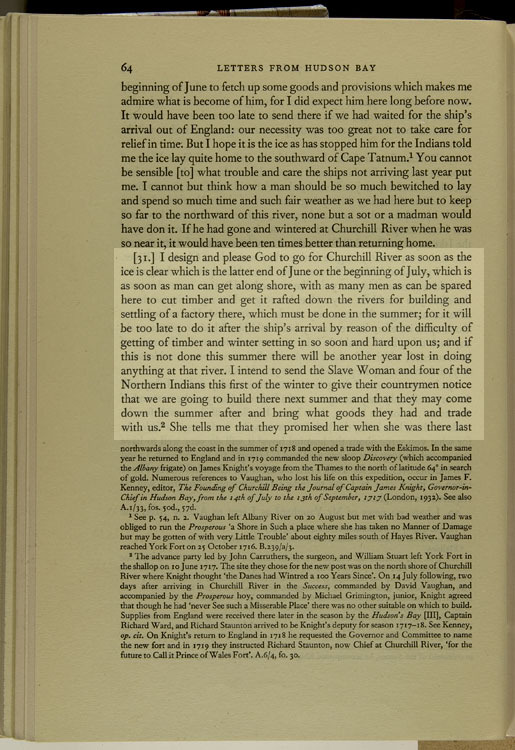 Here, he elaborates his plans for the 'northern trade': a small post was established at Churchill River in 1717, but a group of Dene traders had already come and gone before the Englishmen arrived. The young apprentice Richard Norton was sent after them and brought back at least 12 of them, but the entire group were starving by the time they arrived back at Churchill. September 17, 1716, p64-65, 2nd pgh:"I design... Iskemays." "I design and please God to go for Churchill River as soon as the ice is clear which is the latter end of June or the beginning of July, which is as soon as man can get along shore, with as many men as can be spared here to cut timber and get it rafted down the rivers for building and settling of a factory there, which must be done in the summer; for it will be too late to do it after the ship's arrival by reason of the difficulty of getting of timber and winter setting in so soon and hard upon us; and if this is not done this summer there will be another year lost in doing anything at that river. I intend to send the Slave Woman and four of the Northern Indians this first of the winter to give their countrymen notice that we are going to build there next summer and that they may come down the summer after and bring what goods they had and trade with us. She tells me that they promised her when she was there last that they would get a great deal of copper to bring down against we settled at Churchill River and that there would be a great many there next spring to look for us, if any of the Indians did make their escape from the Iskemays." This was not the first HBC attempt to settle at the mouth of Churchill River. A small trading post was built there in 1688, but it burned down in 1689 and was not rebuilt. When James Knight arrive at Churchill River in 1717, he remarked that he could not find a good place to build a house, "but at one place... where formerly the English had built one which they found so badd that After they had built it I believe they was so Disscouraged that they sett it a fire to Run away by the light of it."